What we liked most was Poseidon Charters staffs' wonderful personal touch, their intimate knowledge of the Greek island and their genuine interest in all aspects of our trip (one-way Athens-Rhodes yacht, Athens & Rhodes hotels, insurance, etc..). Having done this trip twice now indicates just how much we love the Greek islands and Poseidon Charters! and friendly, assisting us with all our needs and more. The sailing itinerary seemed to be individualized for us to make the most of the time and conditions. Responses from Steve Parry at Poseidon Charters' main office were efficient and helpful. We enjoyed the freedom of having our own boat coupled with the safety net of having an experienced captain on the lead boat to give us directions and instructions for each day's sail, and not having to worry about making difficult decisions on when to sail or not depending on the temperamental Aegean winds, something we didn't feel sufficiently experienced to do, and thus the flotilla setup was ideally suited to us. It also made everything a lot easier to have someone with local knowledge to give us tips on where and how to moor, as well as good places to go out. Nanna Lunneburg & crew of 8 Graduate students. London, UK. Poseidon Charters arranged a 'Gulet' cruise along the Turquoise Coast of Turkey aboard the 62 foot M/S Kadirga. We were able to charter by the cabin, sharing the spacious gulet with two other couples and a crew of three. Every day brought a new adventure, from mud baths to visiting St. Nicholas island and taking in a spectacular sunset high on the cliffs. At our final port of call in Fethiye, we were able to enjoy a massage in a Turkish "hammam", followed by a shopping spree in the bazaar. 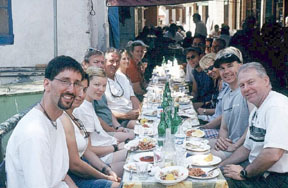 Our seven day trip was relaxing and we were thoroughly spoiled by the great Turkish cuisine offered three times a day around a large dining table under the aft canopy. Sailing "by the cabin charter" on a gulet is unique since it offers the comfort of a large yacht with cabins which are spacious by sailboat standards, as well as private washrooms. The topside space easily accommodates all passengers for sunbathing as well as sleeping under the stars. With one exception, all evenings were spent anchored out. All in all, our gulet voyage was a memorable experience and we would love to do it again with Poseidon Charters! It was the first time for Gianna, but the second time through your wonderful 2 week Archaeological circuit for me. I am so pleased that I could share the experience with her. The sites, food, Poseidon staff and services were all 5 star! See you again soon. Many thanks. When we first began our search for a crewed power yacht in the Greek Islands we were concerned that we were on unchartered waters...we didn't know what to expect or who to rely on. Poseidon Charters have very firm rules for good reason but at first they didn't seem to have the flexibility that we required. We challenged you to have a minivan at the airport that would get seven of us to the slip in time to cross the Saronic Gulf in time to travel inland 45 minutes and get us to the 6000 year old amphitheater for the once a year production of Hercules. No problem, it worked great. It was your thorough communication and personal visit to the boat that gave us enough confidence to move forward. As a boat owner I knew what to look for but it was the final inspection and the greeting of the crew that finally put us at rest. The schedule was altered to address our whims whenever we taste. The crew anticipated our needs and even figured out that I'm picky about having a real cold beer on hand. As a captain, I really marveled at the delicate maneuvers required to double or triple dock where there were just too many boats for the facility. There was never a moment when I felt that poor decisions were being made. The captain was always in control and maintained low profile otherwise. I really don't know how the trip could have been improved on except perhaps we could see the rest of the islands earlier in the season as the weather permits. I guess we will just have to consider that upon our return. Thanks so much for all your help in making our trip so memorable! First of all thanks for the pictures that we received this week. They are a nice reminder of the wonderful holiday we spent with Poseidon sailing the Turkish waters on our 63 foot ketch, 'Dragut'. The high expectations we had of the sailing trip were definitely fulfilled. You and Gary were excellent captain and crew. You took us to nice and unexpected places and you were both fun to be with. You could even handle our 6 kids on board, quite an achievement! We definitely will try to sail with you next year again. Maybe this time the Greek waters? We wish you the best until then! Just returned from our trip to Europe and I wanted to send a quick note on a couple of things. First, it was FANTASTIC! I'm writing to provide feedback on a charter trip with skipper with Poseidon Charters. I chartered a brand new Beneteau Oceanis 393 with Capt. 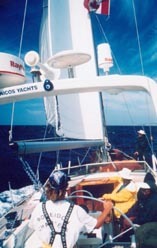 Mixalis Vagenas as the skipper on 1 June for a 5-day cruise from Rhodes to Samos. The experience from start to finish was excellent. The boat was perfect - clean, well-outfitted and completely prepared for us. But what made the whole experience really great was Mixalis. Not only is he an excellent, knowledgeable and safe sailor, he is an outstanding person. Within an hour of starting out he felt like a friend. Mixalis went out of his way to be sure we had a great time and that we didn't have to worry about anything. One of our passengers was unfamiliar with sailing and a bit uncomfortable at times - he was very aware of the situation and helped her feel comfortable. By the second day his efforts ensured she had a great time. He shared with us his extensive knowledge of the Dodekenesse Islands and helped us better understand Greek and island culture. He is a great person and a great sailor. I would highly recommend him as a skipper in any situation. He should be at the top of your list of skippers. I've had many experiences chartering with skippers and I would rank him as the best I've had. Thanks again for a truly wonderful charter experience. If you'd like additional information, please feel free to contact me by email. I hope to be doing business with you again in the future. We sailed IRINI V, a newer ('99 I think) Beneteau 361. For the 2 of us it was a terrific boat, and could have easily accommodated another couple. The amenities were great as well - GPS, Autohelm, CD Player, Extra water tanks (400lt. total I think) extra fuel in 10 lt. cans, bimini, excellent dinghy (Zodiac) and more - really very nicely outfitted. The boat handled he Saronic gulf very well, and could have taken care of us on passage to the Cyclades, but we opted to do that via ferry. I'd recommend adding a stern rail mounted BBQ grill for more cooking options. I would charter IRINI V again in a heartbeat. Jan and I simply loved the boat. Jan and I split our 7 day charter by joining a flotilla led by Poseidon Charters for the first 4 days, then bareboating on our own the last 3 days. I can't say enough about the service and feeling of being part of the group that the flotilla experience provided. Having never sailed in the Med with it's unique challenges (and beauty!) the sense of security we had by being part of the flotilla was immensely valuable and gave us the confidence we needed to venture on our own for that last 3 days in the Aegean. I don't recall how many times we asked for Steve's help, from mooring on a wall, to freeing an anchor at Hydra, but it would have been much more difficult without his expert help. 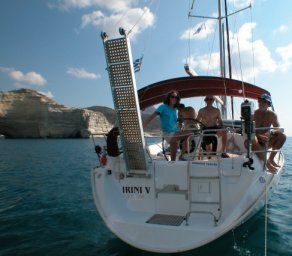 For anyone thinking about chartering in Greece, or any other waters with which they are not familiar, we strongly encourage joining a flotilla for at least part of the charter. By the way, the flexibility that Poseidon offers far exceeds any other charter company's ability to customize services to the degree we experienced. We looked at a number of competitors including The Moorings, Sunsail, GPSC. Not one could match the total service program that Poseidon Charters did. We would definitely do the flotilla again - even if only for part of the charter. The camaraderie is wonderful and we made friends - something which is hard to place a money value upon. The Poseidon Team: Steve, Gary and Sharon were terrific. We really appreciated the hospitality that was extended to join the Aegean Dream crew for dinner on the boat at St. Nicholas bay after a fun evening barbecue. At all times, we felt the comfort of the flotilla support, making our charter nearly effortless (except Med mooring!) and worry free. Great job!! I wish we could do this every year, and we definitely plan on coming back. George and Jan Stecyk, Chicago USA. We enjoyed the experience with you - particularly the 'up front' preparations. The entire experience was phenomenal. I own a sail boat and have spent considerable time in the Bahamas and other areas but this was the first time for a 'charter'. I am seriously considering giving up my boat and becoming a permanent charterer - it certainly doesn't cost much more than owning. We just wanted to send Poseidon Charters a short testimonial to compliment Captains Frode and Kristin Flatnes, for the great job that they did during our June 1 to 15, 2002, charter aboard the 65 foot sloop 'Margarita'. But first I must compliment Poseidon Charters on the entire charter experience. Poseidon more than met all the promises that were made at the boat show and those in the company brochure itinerary as well. As a teacher of secondary school for over 34 years I have run my fair share of field trips; one day, overnight and full week long. I know how much work goes into creating an enjoyable, productive outdoor experience. Poseidon has met all the criteria in your Archaeological Adventure Cruises Program. I would never hesitate to recommend your trips to friends. Now about Captain Frode Flatnes and Captain Kristin Flatnes. Clare and I have been home from our Archaeological Adventure Cruise just long enough to reflect on our two weeks aboard 'Margarita'. Our experiences on the charter more than met all of our expectations. Not only was the itinerary superbly crafted and expedited, but our skippers Frode and Kristin were the gems of the trip. They were competent and full of youthful enthusiasm, always ready to assist. The fact that back home in Norway, they both had worked with young people aboard a sail training vessel could account for their sensitivity to our needs throughout all aspects of out voyage. But it was a real plus to learn that Frode is also an accredited, practicing Registered Nurse. We enjoyed a number of robust sails during our two weeks, with winds rising one day to 30 knots and then increasing to gale force the next. Under Frodes capable seamanship, we reefed down the main and adjusted the sails so that aboard Margarita, it was calm and comfortable. Frode arranged the running of the ship throughout the charter so that everyone got experience with all aspects of sailing and docking. This included giving the novices experience on the helm as well as allowing those of us who were willing, the opportunity to anchor the boat, backing her down stern first to the sea wall in the typical Med. docking routine. On our last day of sailing with the wind on the nose and salt spray flying over the foredeck, I asked Frode why he seemed to enjoy going forward and taking the salt spray in his face. His answer; » I am quite comfortable in salt water. And My hair combs out better after being in salt water spray.. » I think I can speak for all of our « crew » when I say that this was a great charter experience for all of us. Just a note to tell you how wonderful we thought our travel with Poseidon Charters was. We have been spreading the word among friends and E-mailing them the URL for the photo web site. We love the photo of me on the boat and have a framed 8 x 10 higher resolution copy sitting on our kitchen table. We had a lot of fun, enjoyed the variety of activities and people, saw super stuff, ate well, relaxed, slept well. It was a SUPER vacation. Best wishes to you, Frode and Kristin, and Panos. I really wanted to let you know what an absolutely awesome time I had on the adventure. The trip could not have been more perfect, and exactly what I was looking for in a sailing vacation. More actual sailing and less motoring would have been an added bonus, but there was no wind on many crossings and I understand we needed to get into ports. Sharon and Gary were absolutely wonderful - 2 people who did an extraordinary job in making this trip memorable. Sharon was always there for us -whenever you needed help either on the deck, in the cabins, at the galley , or in ports she would make sure you understood what was going on and what needed to be done. She was an excellent guide in all the ports , and didn't make you feel that you were left on your own to figure things out. But at the same time, she could sense when you wanted time to yourself to be alone. Trying to be a hostess to a wide range of personalities is a very demanding job, and Sharon does that job exceptionally well. I could not have asked for a friendlier, more personable, or experienced captain than Gary. I felt at complete peace and security with Gary as captain. I knew nothing would go wrong on the trip, as soon as I sailed with him for the first few minutes. He has a manner about him that is very quiet, and is able to take in everything around him to make decisions. I wanted a trip where I could do a lot of the sailing - not just the captain; I was able to do this on this trip, and while doing so, was not put down upon because of something I did not know how to do before. We were all encouraged to gain more experience in our sailing skills, and Gary was there to assist us in an encouraging way. He was able to make each of us a better sailor by meeting us at our own comfort levels, and then nudging us to grow further. I cannot compliment Gary enough for a job well done. I would most definitely recommend him to others if they are in need of a captain. Thanks again Steve. I also wanted to let you know the hotel in Athens was great. If I come back to Greece, and need to stay in Athens, that would be the place to stay ! As your next season approaches, if anyone is debating whether they should use your company or not, you may feel free to give them my email or phone number, and have them contact me. I would be happy to let them know about my experience with Poseidon Charters. Happy Sailing! Karen Thurmond San Diego, California, USA. 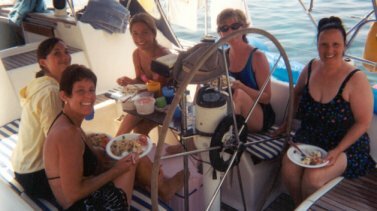 After spending a number of years in the Great Lakes region of Canada dingy and keelboat racing, I was introduced to the excitement and pleasures of sailing vacations in 1993. Since then, I've done bareboat charters in Scotland, Florida, the USVI's, BVI's, St. Vincent and the Grenadines, and Greece. While researching for my first sailing trip to Greece in 1999, I had the good fortune of speaking to Steven Parry of Poseidon Charters. 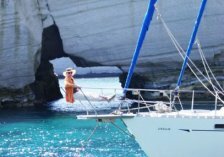 I spent a great deal of time researching a sailing trip to Greece, spoke to at least 7 different charter operators and brokers, and was immediately impressed with Steven's superior experience and knowledge of the Greek waters. 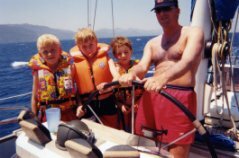 This was especially important to me as it was to be my first time sailing in Greece, and first time acting as Captain of a bareboat charter. Even before I had made my decision to go with Poseidon, Steven took the time to discuss with me the weather patterns and hazards of the areas I was interested in sailing, and was very helpful in pointing out the « must see » places of cultural antiquity and the « must do » activities on the local islands. Steven took the time to help me plan my course in detail, being careful to cater to the safety and pleasure of my entire crew. It was clear that Poseidon was the right choice, and I was happy to find that the rates were competitive as well. Our yacht was a new Beneteau Oceanis 411. 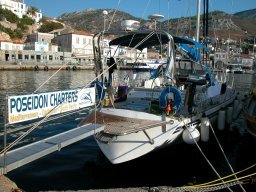 In 2001, I was planning a second trip to Greece ... again, Steven and Poseidon gave me excellent service, and offered competitive rates and a wide range of very suitable and well-equipped yachts. 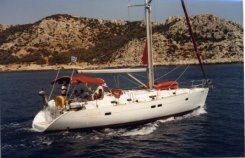 We chose a Beneteau First 45F5 from Rhodes to Paros. With his help, I planned and executed yet another successful trip, and my friends and I look forward to being able to get back to the Greek islands again soon ... with Captain Parry and Poseidon's guidance, of course! Jeff Molson, P. Eng. Field Applications Engineer. We arrived home in good condition, somewhat worn by the 12 hr flight, but basking in the warmth of a marvelous cruise and experience with you on the Annito and the Greek Islands. The trip exceeded our fondest expectations. We are grateful for what you have put together and shared with us. We have plenty of pictures and will share them with all who will listen. Should you ever find yourself in or near Columbus, OH, you have a home with us. Good luck and smooth sailing with your premier travel opportunities. Avant de partir en vacances sur mon bateau et ... à la pluie je voulais te dire bonjour et combien je regrette le soleil de Grèc. Lorsque tu seras à Montréal Donne-nous des nouvelles. Peut-être aimerais-tu naviguer sur les eraux brunes du St-Laurent? Je suis disposé à te faire profiter de ce plaisir. We got back last night after a car tour of more sites - we had a wonderful time and want to thank you for taking such good care of us - between us we certainly have changed mike's life - he plans to continue sailing and you will probably see him in the Caribbean and maybe again in Greece - I hope that you will stop in Cape May and stay overnight on your way to and from the boat show - you really should see the boat that Bill built - it is quite different and is fast. The Dixons from Pa. are coming here for their anniversary from the 14th of september to the 18th. It will be fun catching up with them. Just dropping you a e-mail to let you know that I have a bunch of pics up from the trip, I will be putting more up as the week goes on but the majority of them are up. They turned out great!! Also, just want to say since I have been back and reflecting on the trip and viewing the pics...all that I can say is WOW!! !What amazing memories! We did a lot and saw a lot! I was a nice personal touch that you and Captain Brian added to the trip. Thanks! !Your a great host! Hopefully I can do the Caribbean cruise!! Crewed Bareboat Charter, Greece 1999. Kali Mera! Jack and I can't thank you enough for making our charter with you in Greece "an adventure beyond expectation"! Sailing in the Cyclades is truly, "the most fascinating in the world". I have sailed the Chesapeake, New England, both Florida coasts, the Virgin Islands and the Grenadines. None compare to the magic of Greece. never seen by most who visit these islands. We discovered early on, with your experience of nine years sailing these waters, you always knew the best stops to swim, snorkel, sightsee and eat. We were more than content to follow the well planned 'Aegean Adventure Tour's schedule. With our large group of eight, it released us from having to arrive at any group decisions making days lazy and effortless. The special music you provided on board was an unexpected treat. We are envious of your extensive collection of CDs. Perhaps the most important was the absolute assurance we felt with your expertise as captain. It was obvious immediately that we were in the safe hands of someone well trained in all areas of seamanship. Even with our inexperienced crew ,you were always patient and provided clear instructions. We took great comfort having met you prior top the trip, there were no surprises with unknown captains or quirky personalities. After much research we found that only Poseidon Charters offers this assurance. No other charter agency has such hands on experience. Ultimate Products, Inc. -makers of the world famous Ultimate Hat and Skipper's Sailing gear! ...My absolute favorite evening was sleeping under the Stars at Kleftiko, Milos. When I gaze up at the night sky now and see the constellation Orion, I can remember so clearly lying on deck and looking at the very same set of stars and how different it looked...so vibrant...so close! Perry and I will always remember this trip as one of our best! I work as an independent contractor sourcing office-building investments for a venture between Goldman Sachs and Wellsford Real Properties. During my leisure time I have run with the bulls in Pamplona, play club rugby, bungee jump, ski, run long distance road races, backpack, rock climb, hunt and sail. Currently, I am the sail fleet captain for the Maryland yacht club, a 90 year old club located on the Chesapeake Bay. My wife and I contemplated our two-week trip to the Greek islands for three years. Not only did we speak with a representative from Poseidon Charters at two annual US Boat Shows but we also spoke with the competition. We sent for brochures, surfed the web, and read books on Greece. We even spoke to a solo circumnavigator who convinced us that bareboating was not the way to go. We became convinced (and remain so) that Poseidon Charters had the program with the most adventure and personal attention to the overall experience. Poseidon Charters' brochure promised exactly what was produced. We experienced a sailing tour of the Greek Islands, where we saw great beauty as well as antiquities, in both remote and cosmopolitan settings. We sailed the boat as crew to an ambitious number of islands, each with its own food, culture and beauty. The brochure promised time for ourselves, which we got, as well as organized outings, which also happened. Along the way I spoke with other Americans, who were both bare boating and touring with captains. Not only were they all making only about half the landfalls we were, but also they related horrific tales of difficulties at the anchorages. immediately alert to a change in rpm's, a deviation of course, a shift in wind, an event that would change the sail plan, or a potentially dangerous situation. In short, he was trained, experienced, and he knew where he was going and what lay ahead. In our opinion Poseidon Charters is the only choice for sailing the Greek islands. We have told so many people about our sailing trip. About half of them are dumb founded because they can't imagine being on a "little boat". They can only relate to cruise ships with 1000+ passengers. Go figure! The other half are envious and curious about all the details of our trip. It takes all kinds! We really enjoyed our shipmates and although there was a great diversity of personalities, it kept things interesting and fun. Of course, whoever "up there" dictates the weather was exceedingly kind to us. We greatly enjoyed your company, "killer lunches" and I love your musical taste! Have a good holiday season and take care. We're retired, in our 60's and have done quite a bit of traveling. Without any hesitation this was one of the best vacations we have ever had. expect in terms of accommodation, supplies and scheduling, what we would need to bring and what our role would be as crew. Steven you really were an exceptional guide. The tavernas you took us to, the archaeological sites you arranged for us to visit, the fun things you organized, all made this adventure sailing a very enjoyable experience. What a wonderful adventure. Great fun. Great Yachtsmanship and as usual you were great company. Thank you Steven, and stay tuned for our Caribbean dinner. Nous tenons a te remercier infiniment pour cette belle aventure! Tu avais bien su nous décrire ce voyage en voilier et aussi vivre une experience inoubliable. Nous avons beaucoup apprécié ton incroyable experience marine, Capitaine Crouche! Peut-être aux Caraïbes, qui sait! Et nous voulons te laisser ce petit présent et boire à notre santé du rhum et nous avoir en pensée lors d'un prochain voyage! Au plaisir de se revoir Capitaine! I wanted to tell you what a great time I had in Greece - The two weeks in the Aegean were all I'd imagined they would be. The skipper went out of his way to make sure that we had lots of variety everyday - so many different islands, little off the beaten track bays for swimming, gorgeous on board lunches and lovely tavernas for dinners. I was especially touched by my surprise birthday party - and the middle of the night farewell, complete with hot tea and smiling faces! Bravo Poseidon! Welcome home! Hope that your third trip went well - not as much fun as the second, but a more proficient crew?! I enjoyed the entire experience and I shall look forward to hearing of your plans for next year. It was a great escape- thank you! Enjoy the photos and get a well deserved rest! Retired Air Canada Flight attendant.